There’s also a trend for “listicles” citing highly ambiguous alleged “red flags” for psychopathy (usually the kind of traits one might attribute to a former parter following an acrimonious split). I blame Jon bloody Ronson. Lots of people seem to be self-publishing books on a similar basis! I read this post and thought it was very interesting. For the last few years psychopathy has been a key part of a course I currently teach at the University of Greenwich in Organisational Behaviour – which has proved to be very popular with my students. My own interest in this topic came about when I was the victim of a psychopath in 2003/4 and again in 2011, and I can honestly say that it was one of the most genuinely upsetting and terrifying experiences of my life. If I knew then, what I know about psychopathy now, I would have avoided this terrible experience. But I have since read a range of excellent material about what psychopathy represents, how to avoid it, and what to do when we encounter a psychopath. And this has effectively informed the material I currently teach on this topic. I don’t agree what was mentioned in one of the comments to this post, and I think that Jon Ronson’s excellent book in this area (The Psychopath Test) is one of the most accessible and engaging commentaries on how psychopathy manifests itself in contemporary society. 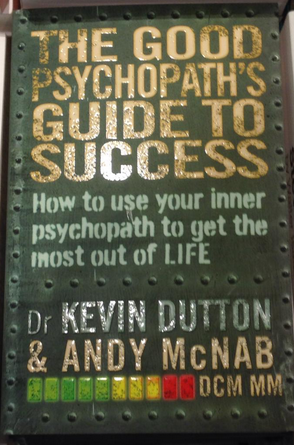 I also don’t agree with the perspective of psychopathy offered by Kevin Dutton and Andy McNab in their book on this topic. I feel that this represents a disturbing precedent in how this truly abhorrent human condition is becoming conceptualised, and I don’t think that there is anything “good” about psychopathic behaviour. While I wouldn’t argue that many “successful” individuals would indeed score high on Hare’s Psychopathic Checklist (PCL), I would also suggest that the damage incurred by psychopathic behaviour should be given a lot more attention. I believe that the study of psychopathy has now “hit the zeitgeist” in terms of what is fashionable in the sociological and human sciences, and I would suggest that the author of this post avoids Dutton/McNab’s work, as above all, it “sensationalises” this condition, without looking enough at its real impact. I have personally learnt a lot about this pathological aspect of the human condition since I first seriously studied it five years ago – including the many forms it takes, the effects it has, and the strategies I will adopt to ensure that the psychopath I encountered will be accountable for their behaviour. As a postscript to this reply, I would welcome a debate on the “sociological role of psychopathy” for this blog, and be willing to make further contributions towards this. You are right on point. Kevin Dutton is a quack. I slowly came to understand that the dysfunctional behaviors in my family, and my resulting episodes of major depression, were due to my family being mostly psychopaths. The gene runs strong in my family, and there are equal numbers of female-to-male psychopaths in my family. Why is it nobody teaches children about personality disorders and protecting yourself from con artists? There seems to be some conspiracy among psychopaths in power (they are definitely in the Psychiatric Associations) to keep the disorder hidden from society. Psychopathic politicians make policies that keep people ignorant. I happen to think that if someone had told me at the age of twelve that my father had a brain disorder, I would have adjusted much better in life. I am so glad that you are in a great position to use your experience with psychopaths to educate others “officially” in a university setting. The best of luck to you! Maybe we need a distinction between psychopath and sociopath. Does the lack of empathy that many sociopaths exhibit have an affinity with a post-modern, narcissistic and celebrity-obsessed society?